Human beings have been eating oats in various forms since earlier time and it is nothing but cereal grains. It has crucial properties that are beneficial in lowering the cholesterol levels of a person and thus helps him/her in remaining healthy. Oat flour is made from grinding oats and it does not have any gluten contents. Therefore it is usually mixed with other ingredients to make a simple but tasty dish. Oat flour recipes are necessary for making various food items that every one finds delicious as well as healthy. People have been using oat flour in making breads, muffins and other baked goods and for this purpose they have to buy oat flour from market. But now it has become quite easy to make it through oat flour recipes at home with help of a Ninja Blender. Ninja is a well-recognised brand whose blender works in an efficient manner to provide necessary consistency so that a person can grind the requisite oats successfully. Oats have a very high content of fiber and are an excellent addition to make a diet well-balanced one. Therefore home makers have been using oat flour in gruels and in baking dishes. In order to do so they require a perfect guide in the form of oat flour recipes who will help them to overcome all problems. Arranging ingredients before hand is an important part of any dish-making. In order to make necessary oat flour one must buy ‘’rolled oats’’. Plain oats are best for making food items instead of flavoured oats and they are also easily available in every grocery store. If a person is going to use oat flour immediately it is sensible to measure oats a bit more than the required amount because once they settle down after becoming flour its volume decreases. A person ends up with ¾th quantity of the original oats after grinding. Ninja blender is a standard device that is useful in grinding oats to make oat flour. Simply pour required amount of oats in a blender and switch it to position ‘’2’’. After few seconds medium speed of a blender helps in crushing oats. It is prudent to stop and mix the oats once again in a blender. After stirring it for few minutes switch blender to position ‘’3’’ for few seconds. High speed of blender will help in creating required oat flour that has a powdery and fine consistency. It has a similar resemblance as wheat flour. Oat flour is now ready to use and if extra can be stored in an airtight container in a place that is dry and cool for long lasting usage. Usually oat flour lasts for a period of six months in refrigerator and for nearly two- three months in a kitchen cupboard. Adding oat flour to a gluten-free diet enhances its nutritional values especially minerals and vitamins like vitamin B1, magnesium and zinc. It also increases anti-oxidant levels and hence is quite beneficial. Bilirubin is an anti-oxidant that helps the human body in elimination of free radicals. It also acts as a protective agent for a brain from oxidative damage. Oat flour helps in improving our immune system against parasites, fungi, viruses and bacteria. If a person is suffering from digestive problems then it is sensible to consult a doctor before eating oat flour regularly as it takes a considerable period in its digestion process. This could also result in blockage of intestines. One must be aware that over-eating any product even if it is a healthy product like oat flour can cause serious damages if not eaten in required dose. Hence, it is important to know the amount which our body can accept and digest so that it does not cause undue harm. 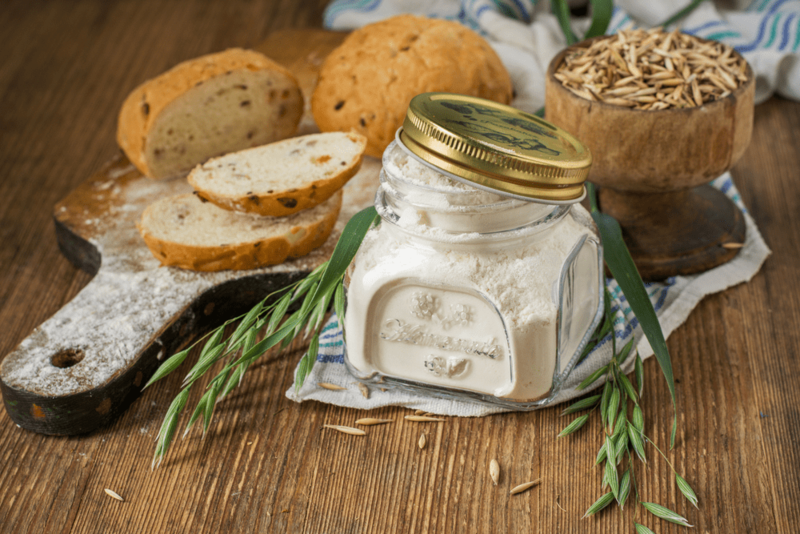 Why do homemakers use oat flour? Oat flour is regularly used in preparation of various dishes as it is considered healthy and provides a distinctive taste and sweetness to the dish. Oat flour has a high content of fiber and protein. It is able to retain its nutritional values and flavour to make a complete and tasty dish. Are oat flour recipes necessary? It is always recommended to go through oat flour recipes as they provide useful information that is beneficial in preparing a tasty dish with minimum efforts.